My training methods are a little different from many trainers because I integrate verbal, visual, and tactile cues in a way that each builds on the other. Many trainers focus primarily on the verbal and visual cues. A point that should be made is there is no "universal" training method used by all trainers. There are methods preferred by each individual trainer that meet a certain set of training goals. My goal is to train dogs to work in distracting and public situations (service training). For training, I recommend the use of a training collar. A training collar should not be confused with a choke collar. In my opinion, choke collars are used with dogs that are untrained and need to be managed with force (something I don't agree with). 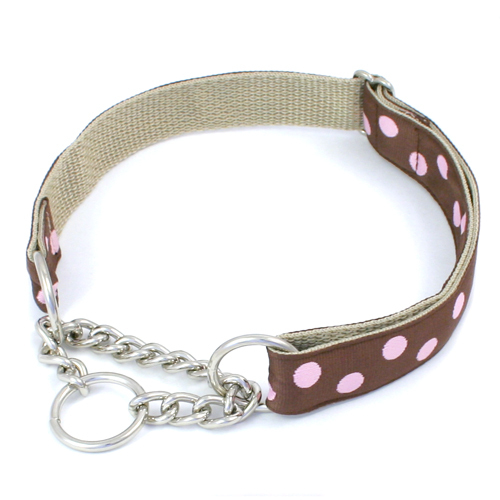 A training collar allows for some constriction but does not choke. A regular collar is fine too although a training collar is more effective. I break training of the "sit" command into three phases. Verbal command training, visual command training, and tactile command training. Buy some dried chicken strips or any other treat that your dog really loves. Cut them in to small pieces (dogs don't gauge size. A little treat works just as well as the whole thing). A single chicken strip should make 20 treats. Place a training collar and leash on your dog. Get your dog's attention by showing him the treat. 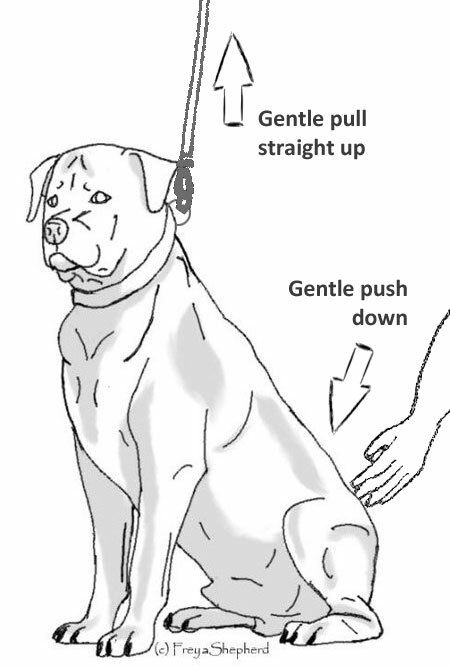 Immediately after saying sit, (assuming your right handed) pull gently directly upward on the leash (not backward or forward - directly upward) with your left hand. Then using the two longest fingers of your right hand gently press down on his hind quarter just above his tail (on the center of his hip two or three inches before his tail). He will sit. As soon as he sits, reward him with a treat and praise him verbally. Do the above in five to 10 minute sessions a few times a day. Eventually he will sit without pulling up on the leash and pressing down on the hind quarter because he now knows the word and what action gets him the treat and praise. Theory: When you pull directly upward gently on the leash, a dog's natural response is to attempt to shift weight towards their hind legs. The down pressing in the hind quarter encourages him to do a full sit. By now, you have him sitting reliably on command. Now lets teach him to sit by visual command. The visual gesture I use for "sit" is to extend your open hand palm up at waist level. Then raise it up rapidly about a foot or so. Think of the motion when you place a tennis ball in the palm of your hand and raise it up. Make sure you have his attention then say "sit" while making the visual gesture described above. Reward him when he sits. Do this exercise for five or tend minutes several times a day. As time progresses, make the gesture first and delay saying "sit" by a few seconds. When he gets to the point where he sits before you say the command he is now understanding that the gesture means sit. At this point you can stop saying sit and just use the gesture. Note: I use the palm up gesture rather than pointing up gesture used by some trainers. The reason being that the gesture is more easily recognized by the dog from a distance. I don't use the treat over the head approach many trainers use in phase I because it is itself a gesture that then needs to be unlearned in this phase of training. This can be swapped with phase II if desired. When your dog learns to "heel" you will want him to sit when you stop to do something or talk to someone. It's likely that your dog hasn't learned to heel yet but this will be something that he can learn to do beforehand then apply later when he learns to heel. Place you dog on your left side so that both of you are facing the same direction. Say "sit" while making a gentle tug upward on the leash. He will sit because he knows the command. When he sits, reward him. Walk him in a circle (encouraging him to come up from sitting position), start walking always by starting with your left leg (this is important for when you teach him to heel - starting with left leg = heel, starting with right leg = stay). Stop with him on your left side. Then repeat steps 1 and 2. Do the above in five to ten minute sessions several times a day. Eventually he will associate the gentle tug upward on the leash as meaning "sit" and you will no longer need to say the command. Pups often relapse during training. This is normal. When it happens go back to an earlier stage of training that re-establishes the correct response. Work on sit first. When you finally have your dog sitting reliably on command, you can then work on "stay" then "come" in that order. Your dog needs to learn to sit before he's taught the other two. EDIT: I corrected a number of grammatical and typographical errors in the article, making it easier to read.